Sustainable fashion is one of those things where I really feel like we vote with what we choose to buy. There are so much low quality and unethically-made clothing out there, and it just contributes to the disposable society mindset. I’m always excited when I find another sustainable or eco-conscious option, and I’m glad to share about this one! Ungalli Clothing Company is 100% recycled clothing made from recycled PET bottles, recycled cotton, and scraps from cotton factory floors. The screen prints on their shirts are all water-based inks, and the clothing is made ethically in North America. I got 2 shirts to try out and review, a short sleeve and a long sleeve. In my opinion, the women’s shirts run pretty much true to size, and are just the right amount of fitted. 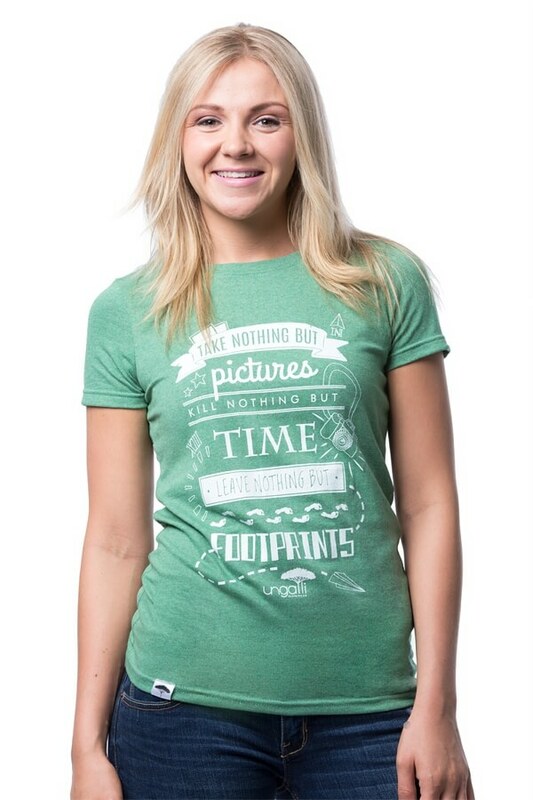 The green “Nothin’ but Footprints” tee is made from 50% recycled plastic bottles and 50% recycled cotton. I really like the feel of the fabric on this shirt, it’s nice and soft. The message on it is one that I love as well, and it’s such a beautiful print! This has quickly become one of my favourite t-shirts! The black long sleeve with bronze print tee is made from 50% recycled polyester and 50% recycled cotton. I found that the feel of the fabric is a bit thicker than the green tee, and a bit rougher to the touch. It’s a shirt that I choose when I want to be warm because the fabric feels heavier. I haven’t worn this one as often, mostly because the fabric doesn’t feel as soft and comfy as the other shirt. Ungalli Clothing Co. also has hoodies and accessories available, and right now they have a 25% off deal when you sign up for an account! Sweet! I hope this Ungalli Clothing review provides you with another option when you need to get some new casual clothes!